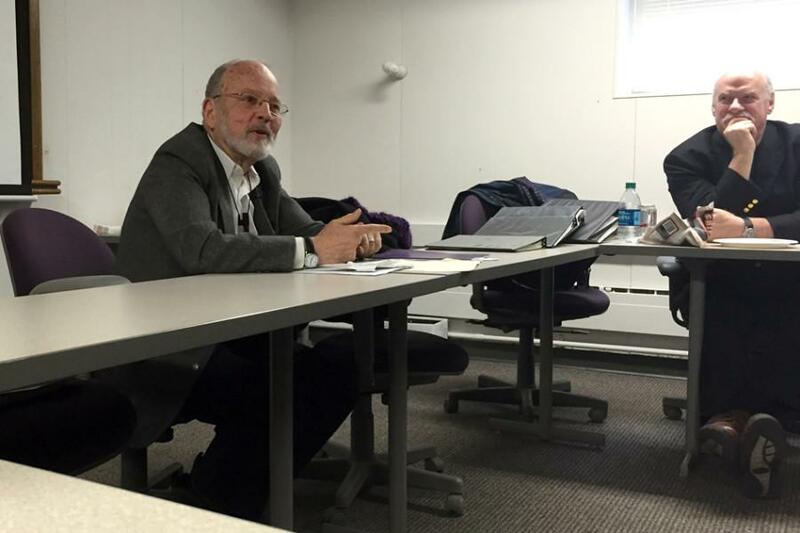 Medill Prof. Loren Ghiglione speaks at a colloquium about Northwestern's progress in implementing Native American outreach and inclusion recommendations. The recommendations were made by a task force following a report on University founder John Evans' culpability in the Sand Creek Massacre. Medill Prof. Loren Ghiglione credited Northwestern students for sparking NU’s recent progress on Native American inclusion, but said the University needs to do more at a talk Friday in Fisk Hall. About 25 people attended Friday’s colloquium to discuss the University’s progress on implementing recommendations from the John Evans Study Committee and the Native American Outreach and Inclusion Task Force. In 2013, members of the Native American and Indigenous Student Alliance felt that the University had “whitewashed John Evans’ career” and petitioned the University to address the issue, which led to the creation of the John Evans Study Committee. In May 2014, the study committee released a report about Evans’ role in the 1864 Sand Creek Massacre, in which 150 Native Americans were killed. Six months later, the task force, on which Ghiglione served, submitted its recommendations to Provost Daniel Linzer and University President Morton Schapiro. Ghiglione said students were largely responsible for NU’s progress on Native American inclusion. Although Ghiglione said he is pleased with much of the progress that has been made, including the allocation of University funds for an Indigenous Research Center and the promotion of the assistant provost for diversity and inclusion to an associate provost, he said it is crucial for the University to hire faculty for Native American-related courses. Ghiglione said another issue was the absence of Native Americans in previous NU diversity reports, despite Native American faculty and staff being the least represented relative to the population, he said. This ties in with several other task force recommendations related to increasing recruitment of Native American students to NU, he said. “If we don’t have programs and faculty, why would an American Indian student come here?” he said. Ghiglione, who is teaching a new class this quarter called “Native Americans Tell Their Stories,” is also directing the National Native American Oral History project with University support. The project was among the task force’s recommendations. The 11 students in his class film interviews with and write profiles of Native Americans in the Chicago area for the project. Ghiglione hopes the course will “build some bridges” with the American Indian Center of Chicago through its partnership with the course. Linzer said in an interview with The Daily last week that it is great the project has come together so quickly. Ghiglione plans to perfect the project on a local stage before expanding it nationally. According to the recommendations, the project could potentially expand globally. David Takehara, the University’s director of financial operations for information technology, is one of the interviewees for the oral history project and attended Friday’s colloquium. “This project is going to keep a lot of memories and experiences alive and recorded for folks who are interested in it later,” Takehara told The Daily. Takehara said he was pleased with the number of students who attended the colloquium. “I’m really encouraged to see so many students getting involved and making a difference in this important subject,” he said. Despite the progress that has been made, Jacqueline Tang, a Medill freshman and former Daily staffer who attended the event, believes more awareness must be raised to address these issues. “I think generally the student body is not very in the know of all this information, and that’s unfortunate,” she said.